Now that it’s summer, my kids and I commute together to work, because their summer camp is at my work. Convenient, no? Kinda. My commute is long. 35 miles long, one way. It’s a rather boring, tree lined, “almost” interstate. “Excitement” during my commute is my son making sure to point out all the road kill while my daughter yells “gross!!!”. Alternatively, excitement can be had by me trying to find a radio station that isn’t “boring” or inappropriate for children under 11 years old. Good times. Times to cherish, or so I’m told. I only partially kid, as my kids and I have wonderful conversations. For example, we love to discuss the merits of autotune and whether a song is plagued by it. Although, there may have been tears involved in the Katy Perry discussion. Katy would never autotune! Anyway….on our way home, when I don’t have something pre-planned for dinner, I get to take everyone to the grocery store. Joy! As we are walking around the store, I come upon the large display of pre-made foods. Row after row of buffets filled with items like salads, soup, meat entrees and vegetables. All for an astounding $8.99 per pound! Most stores have these “convenience foods”, but I walk by it. The illusion of homemade without the work, I suppose. I just marvel because the ingredients that go into these items are conveniently located in the store for much, much less. I try not to be judge-y. Lots of people don’t know how to cook, and this has to be better than something in a box. Plus, I know weeknights are hectic, high stress, and minimal time. Items like this help busy moms and dads put dinner on the table. But, I stopped at the tray marked “roasted eggplant”. Really? $8.99 USD for “roasted eggplant”? The eggplants were only $1.99 a pound! There’s hardly any effort involved in “roasting”. Thus, a blog idea was born. Do not pay for roasted eggplant!! Except, my kids would never agree to roasted eggplant. 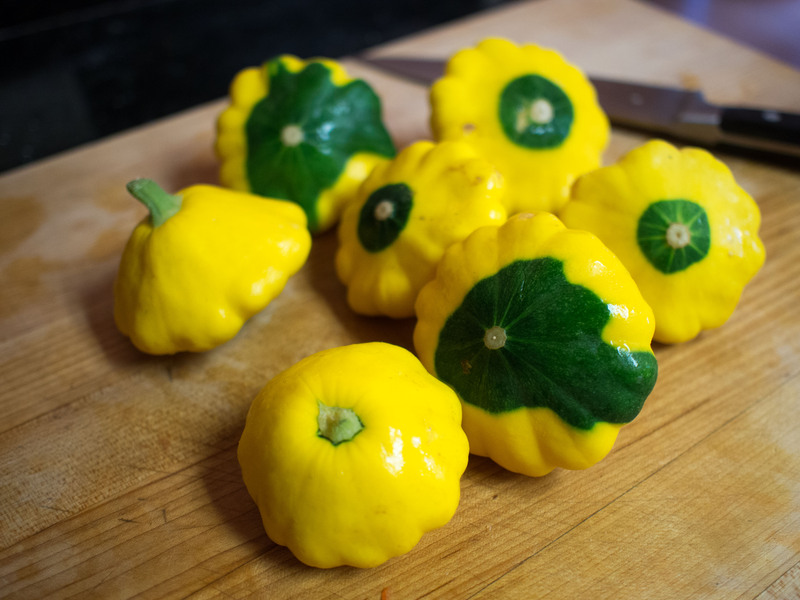 Lucky for me, my store had some beautiful, locally grown yellow and green pan patty squash. So, pan patty squash would have to be a substitute. They may not outright rebel against something so pretty. As an extra bonus, my husband loves pan patty squash. You can use this “recipe” on almost any vegetable that you roast. Even eggplant! To fancy it up, you could grate parmesan cheese on top just prior to serving. I’ve cut the vegetables in chunks, you could do thick slices as well. Whatever shape you like! When you see how easy this is, you will never pay for roasted veggies again! You can totally do this! Consistently cut squash to 1 – 1 1/2 inch pieces. Place pieces on a baking sheet. 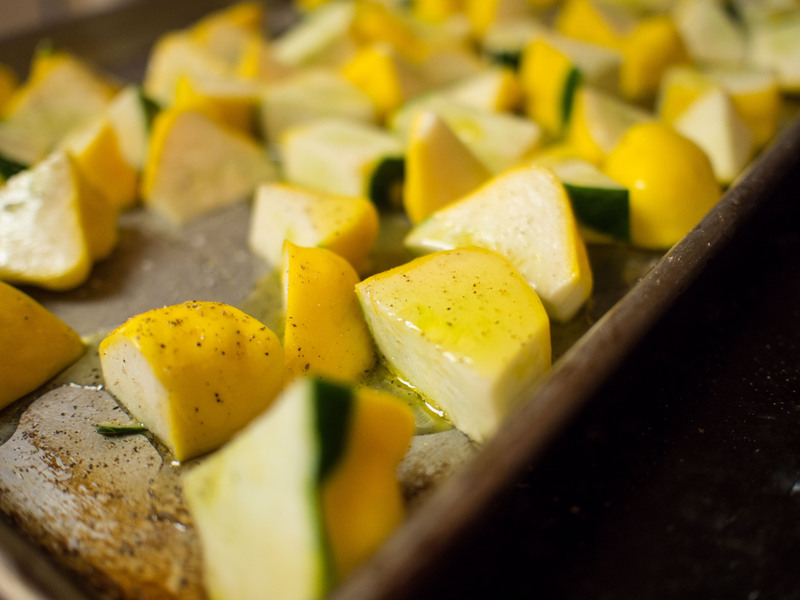 Drizzle olive oil over the squash and salt and pepper. Using your hands, mix the squash so that it is well coated by the oil. Bake for about 7-9 minutes, check the oven to see if the bottom of the pieces have turned brown, if so, use a metal spatula and flip them over. Do the same for the other side. Total time would be about 15-20 minutes, depending on the size vegetable pieces and the accuracy of your oven. Remove from the pan serve. This entry was posted in Vegetable Side and tagged easy, Olive oil, roast, roasted, veg, vegetable, vegetables on June 23, 2013 by dawn of food. Oh my gosh!! I was just sitting down to write my blog and decided to check yours out first when — HELLO! 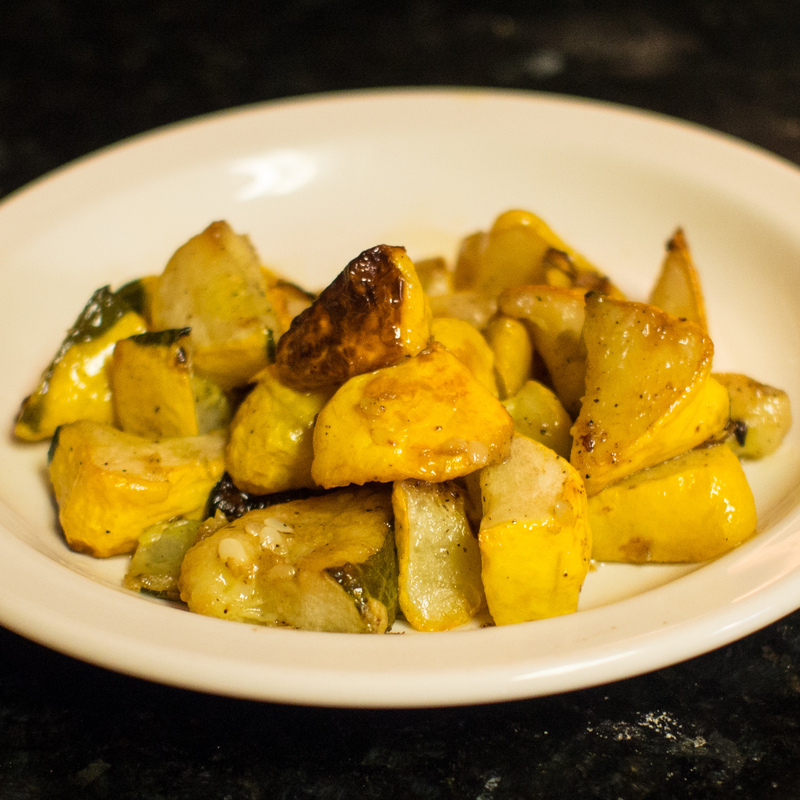 I made Patty Pan squash tonight too!!! Great minds think alike (or maybe it’s because they’re in season!) 🙂 LOVE your blog!! So many wonderful, cool ideas! I should really come see you and take a cooking lesson from you! We should get together!! Your blog is hilarious!!! I love reading your kid’s reaction to the food made!